Our Sales Consultants are the ambassadors of our business and we are on the hunt for Sales Consultants who believe they have what it takes to be a Sales Consultant at Europe’s Largest Health & Fitness Operator. Do you believe you could influence others to improve their Lifestyle? You won’t need to have any sales experience but you will need to be self motivated, with a flexible, approach to the working week and have plenty of drive and determination to succeed as there will be a lot to learn! We sell with integrity and will provide you with the very best training in the industry. In your role you will need to be prepared to have a challenging conversation, where you will have the confidence to adapt and tailor your conversational style and use your persuasive skills to educate and influence your prospect whilst remaining professional at all times. You get what you put in and we offer uncapped commission. We are simply looking for the right behaviours and we can train the skill. So if you have a passion for Health and Fitness, enjoy working as part of a team, have a naturally competitive nature then this could be the opportunity you are looking for! 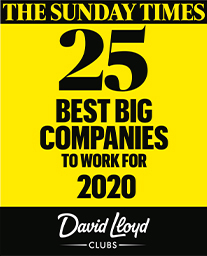 You would be joining Europe’s Largest Health & Fitness Operator and one of the Sunday Times 25 Best Big Companies to Work for 2018! We aim to provide an enjoyable, fun and progressive culture where our ‘values; We Play, Freedom to Succeed, Edge, Will to Win, Passion to Serve and Thank you are brought to life each and every day.